Help, I have an extra cellphone tower! Anyone wants it? 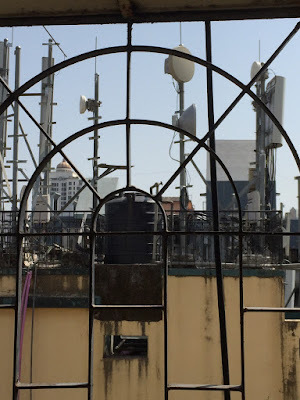 We complain that we have poor connectivity because there aren't enough mobile towers, but I have a problem that is exactly opposite; I have an extra tower! The Airtel network on my cellphone keeps dropping, and when I registered a complaint last year, the engineer came to check the signal strength. He confirmed that the signal from the nearest tower was weak (I live on the 12th floor and face a hill, so the problem was compounded). He promised that a new tower would be set up, and sure enough, within a month, the network strength really increased. I was happy for a few months, then the problem came back. Again, I registered a complaint. This time, the Airtel engineer presented a different reason for my problem. According to him, my house picks up a network signal from two towers which are roughly equidistant from my house. As a result, a section of my house - the kitchen and part of the living room - form a sort of 'dead zone' between the two towers. This causes the signal to drop suddenly if I walk from one room to another, or even move within my living room, as the cellphone drops the signal from Tower 1 and picks up the signal from Tower 2. So, the only way I can speak on the phone is by disposing myself at a certain angle on the sofa facing the window, which seems to attract a good signal. And I cannot move out of this zone by so much as a foot, or the signal drops again. Alternately I could lean out of the balcony and talk, with an extremely strong signal, assuming I want the neighbours to hear everything. So when a friend posted this link on Facebook today, I became very happy. Cellphones that work without towers sound like just what the doctor ordered. Meanwhile, there is no solution for my problem unless Airtel removes or shifts one of the towers. Ironically, the signal was just fine while they had only one tower! It's a case of abundance causing a problem. Cooking tech - which cookware is safe to use? Last week, Dad came over to visit me and happened to see my non-stick cookware which is 7-plus years old, and peeling to reveal silvery metal surfaces below. "You have to replace it immediately", he warned me, adding that non-stick surfaces are suspected to release toxic chemicals, and will probably be banned or discontinued within the next 2 years. I have heard rumors about health issues with non-stick pans but I have not taken them very seriously. Now that I had to replace all my cookware, I decided to spend a couple of days researching options on the internet. There is a lot of confusion and many contradictory opinions as to which cookware is safe or not. I do not really know which are the reliable sources to cite. But here is my perspective, based on technical inputs from my Dad (who is an engineer), granny's wisdom, and the factual sources on the internet. Three years ago, I posted about an embarrassing incident when the central locking/ security alarm system of my car went kaput and the alarm went off continuously. When I look back, this has happened to me three times in three years. If you have a car security system installed, then it's useful to know what to do in case of emergency. Because the emergency involves a loudly wailing siren that goes off unpredictably every hour, neighbours whose sleep is disturbed and general stress for you. My advice in this post pertains only to Nippon, which is a Maruti Genuine Accessory installed by all Maruti dealers. Towers of Death - does radiation from cell phone towers cause cancer? At that time, no one thought too much about it. Then, 2 years ago, Purvi's father was diagnosed with lymphoma. He unfortunately expired last year. This year, her mother has been diagnosed with breast cancer. Though it was detected early, the cancer had spread aggressively in a short time span, necessitating both surgery and chemotherapy. Data plans for 3G - which is best for me? Will you buy a tablet in 2011?